For months my Mum has been extolling the virtues of this cake, the last time I was due to be in Cork she had kept aside a slice for me but unfortunately my brother got to it before I got home. I have been slow to make the cake as I have had a few bad experiences with orange almond cakes which for a while were part of the triumvirate of GF deserts you could get, alongside coconut macaroons and dry as dust brownies. A lot of the orange almond cakes I bought or made were just too wet for my tastes, they went beyond moist directly to soggy and that texture wasn’t for me. However this cake is a thing of beauty, it is probably the easiest cake I have ever made and is delicious served cold or slightly warmed as a pudding. If you are looking for a good recipe for your first attempt at Gluten Free baking than this is the one for you (just make sure your ground almonds are gluten free). There is no fiddling around with gluten free flours hoping for the best and as such this is ideal for beginners to gluten free baking. I made this last Tuesday and I had the last slice on Sunday and it was still delicious, just keep it covered and stored in the fridge. Add in the sugar and continue to beat until fluffy. Beat in the grated zest. Beat in the eggs one at a time, don’t worry if the batter looks a bit curdled. Fold in the ground almonds and scrape the batter in to the prepared tin. Place in the oven and bake for 55 – 60 minutes or until the top is firm and a skewer come out clean. My cake was very brown, this did not affect the taste and in fact the edges were deliciously chewy and almost caramelised but you could try covering the top of the cake with tin foil or moving the cake to a lower shelf if you feel it is browning too fast. Once baked allow the cake to sit for a minute before turning it out on to a plate. While the cake is cooling make the syrup. Use a skewer or a thin chop stick to poke some holes through the cake, this allows the syrup to be fully absorbed. Spoon the syrup over the cake, don’t be afraid to use all of it, I promise this won’t be soggy it will just have a deliciously moist crumb and a lovely nutty texture. 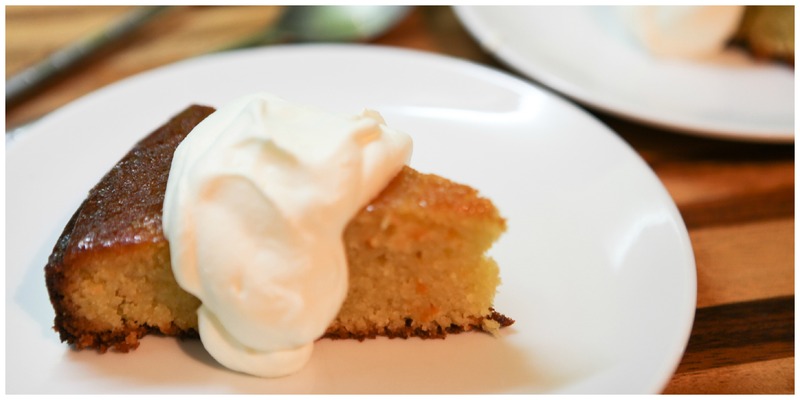 Enjoy this cake warm as a pudding with cream or ice cream but it is just as good when cold.